I added the old Rubber bass construction page to this blog. Now people can comment and show with their own building projects. 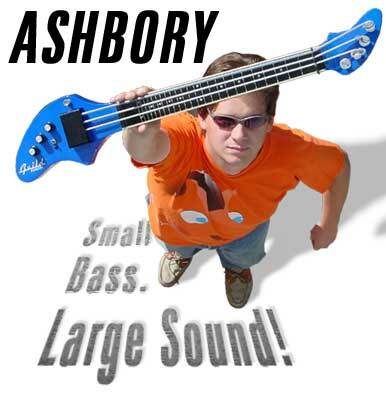 So what is an Ashbory bass? The DeArmond Ashbory Bass is an 18 inch/45 cm fretless bass with silicon rubber strings. Nowadays the bass is produced by Fender. I play upright bass and fretless electric bass and I’m interested in playing this little bass. As a small side-project of building a electric 5 string double bass I decided to make an Ashbory myself (2004)! This is a small report of the work. Click here for a first sound sample! (MP3, 128 KBps – 324 Kb). Note: recorded thru DI directly into Audiowerk (sound card), without additional EQ of effects. So this is the basic sound. And as you may hear: the bridge is not good, it resonates on the lowest string and does not conduct the vibrations well enough. It’s made of wood right now, I think metal is better! Compared to a real Ashbory, this bass is even smaller….the scale is the same as the original “dogbone”, but the body and head are smaller. I wanted to make a bass that would fit in the bag of my double bass….together with the upright big one! The body is made of teak, the same wood as my electric upright. I use the rubber bass every now and then. People are surprised to hear that much low (hear rehearsal sample above) coming from such a small instrument. I tuned the instrument to B-E-A-D instead of the regular tuning of the bass to prevent the strings from breaking again and again. And it sounds really cool. So far, I have used the bass on one recording, which can be downloaded from Rapidshare.